Facebook Arrests Ignite Free-Speech Debate In India A 21-year-old was arrested after she questioned the shutdown of Mumbai for the funeral of a controversial political leader; her friend was arrested for simply "liking" the post. The comment angered the politician's supporters, who some say intimidated police into making the arrests. Shaheen Dhada (left) and Renu Srinivasan leave court in Mumbai on Nov. 19. Dhada was arrested for a Facebook post questioning the shutdown of Mumbai for the funeral of a powerful politician; Srinivasan was arrested for "liking" the post. Shaheen Dhada is an unlikely looking protagonist in the battle under way in India to protect free speech from government restrictions in the new media age. Slight and soft-spoken, Dhada perches on the edge of her bed in a purple-walled room that has been her own for the past 20 years. Outside, police officers are posted for her protection in the town of Palghar, 2 1/2 hours outside Mumbai. The 21-year-old management science grad's Facebook post last week triggered her arrest and the wrath of local residents. Her "crime" was questioning the shutdown of Mumbai as mourners gathered for the cremation of Bal Thackeray, who had dominated the city's political stage for decades with cagey intimidation tactics. In a Facebook post on Nov. 18, Dhada wrote: "Every day thousands of people die, but still the world moves on. ... Today, Mumbai shuts down out of fear, not out of respect." 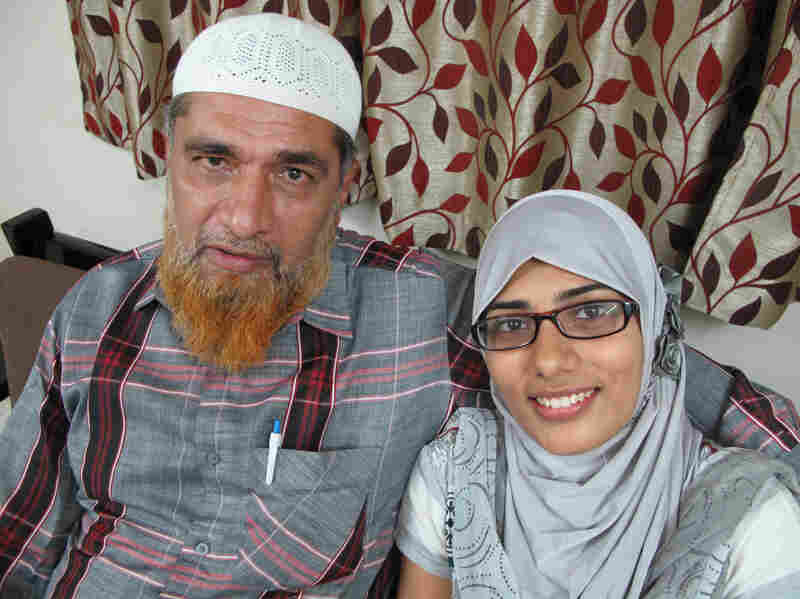 Shaken by the reaction to his daughter's Facebook post, Farooq Dhada (shown here with Shaheen) says in India, freedom of speech "exists only on paper." Within minutes, she got a call from a stranger. "And he told me, 'Do you really think whatever you posted is right?' " Dhada says. "I was actually confused about what he was asking for." She hung up and deleted her comment. But by then a mob had gathered at her uncle's medical clinic around the corner, smashing windows and equipment, and vandalizing the operating room. "Within 10 minutes, the police came and told me to come to the police station. I had to apologize in a written statement," says Dhada, who was held until 2 a.m. and then released on bail. A friend of hers, Renu Srinivasan, who "liked" the post, had been detained with her. A mob descended on the station. Dhada says she couldn't see it, but heard: "They were shouting, and at that time I was really very scared." Meanwhile, Dhada's father, Farooq Dhada, says his family cowered inside their home for hours in the darkness, afraid the mob would come for them next. The episode has shaken the Muslim father of two, who says he never expected things to escalate to such a frightening pitch. Reflecting on the incident days later, he says freedom of speech in India "exists only on paper." He says he doubts the common person feels any sense of security — no matter what religion they are. Shaheen Dhada's post had angered followers of Thackeray, a political cartoonist turned Hindu hard-liner. 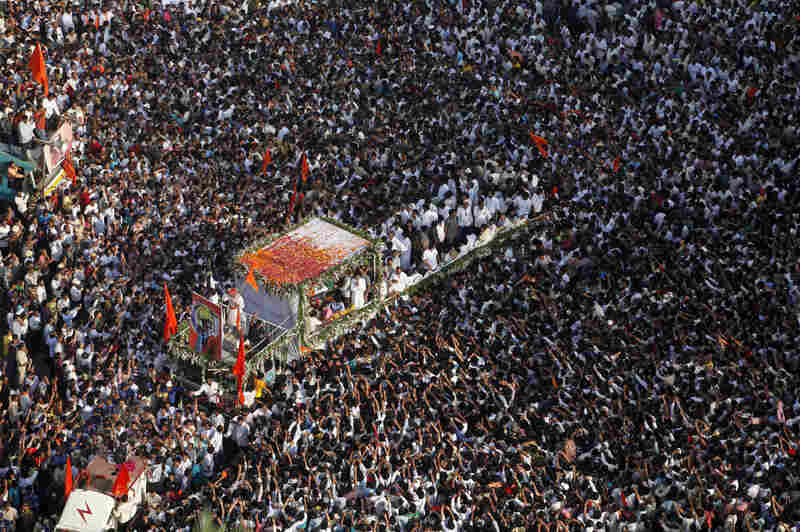 His Hindu party, Shiv Sena, won popular appeal in the state of Maharashtra, where Mumbai is located. Exploiting enmity against migrants from other states, the party encouraged brute force to win jobs and opportunities. Journalist Naresh Fernandes says when Hindu nationalism became a potent force, Shiv Sena turned its ire on Mumbai's Muslims — igniting riots that killed 900 people in 1992 and '93. Thousands of mourners gather beside a truck carrying the body of Bal Thackeray, the leader of the Hindu hard-line Shiv Sena party, during his funeral in Mumbai on Nov. 18. Thackeray fanned the violence, Fernandes says, by "making extremely provocative statements essentially calling upon his followers to attack Muslims." Vaibhav Purandare, author of The Shiv Sena Story, says the party's legacy of violence has cost it support over the years. "They refused to believe that the India of the 21st century was very different from the India of the 20th century ... when a section [of the population] would not mind the use of violence," Purandare says. The bust-up of the medical clinic "shows they continue with violence tactics," he adds. Anil Desai, the secretary of Shiv Sena, says it is not a matter of disowning the violence. "It was an emotional outburst," he says, "and the incidents ... were blown out of proportion, that much I say." At a restaurant in Palghar on Friday night, the talk among locals turned to the Facebook row. Sunil Mahendrakar said Dhada should be prohibited from posting comments critical of Thackeray because he was considered a father figure to many, if not to her. "Talking cheap or bad about somebody's father should be denied, anywhere in the world. In India ... in America," he said. "It's wrong." Retired Supreme Court Justice Markandey Katju says every freedom is subject to "reasonable restrictions in the public interest." But he says in the case of Dhada, her post actually underscores a Supreme Court ruling that bringing a city to a standstill is illegal. "You can mourn a death in whichever way you want, but you can't bring a whole city to a stoppage. So what this girl wrote was in consonance with the verdict of the Supreme Court — nothing illegal," Katju says. Nonetheless, police charged Dhada under a statute that makes it a crime to promote "religious enmity" between groups. The initial police report refers to her as a Muslim. But Dhada says she does not believe she was singled out for her faith. Writer Fernandes says it's more likely police were scrambling for a convenient hook on which to hang a charge. "They needed to find a cause of anger and suggested that she, as a Muslim girl, had insulted them, who were Hindus," he says. "That's ridiculous. She questioned why a city shut down after Bal Thackeray's death — and Bal Thackeray is not a religion; he's a leader of a political party." The general consensus seems to be that the police not only misapplied the law but also succumbed to the will of the mob. "There were thousands of guys outside their police station and inside the station house who were doing what the Shiv Sena has always done — threatening to burn the town up," Fernandes says. "They just wanted to get them off their backs and wanted to make sure that order was maintained even as they didn't quite uphold the law." The case also throws a harsh light on India's new Information Technology Act that governs electronic speech. Police charged Dhada with violating a section of the law, which prohibits speech that, among other things, causes "annoyance, inconvenience, danger, obstruction, insult, injury, criminal intimidation, enmity, hatred or ill will." Pranesh Prakash, the director of the Centre for Internet and Society, says it's a poorly drafted catchall. Under such a sweeping statute, Prakash says, 95 percent of India's Internet users could well be imprisoned. "I have 3,500 followers on Twitter, and I'm pretty sure I annoy 100 of them on a daily basis," he says. Tackling issues of communal harmony is a serious issue in India, but, Prakash says, "it should not lead to forsaking fundamental rights guaranteed by the Indian Constitution." The government conferred Thursday over problems with the IT Act, while the Supreme Court is hearing challenges to it. Shaheen Dhada and Renu Srinivasan are not expected to face prosecution under the country's controversial IT Act or any other law. Following a public outcry, two senior officials from the local Palghar police have been suspended and a magistrate transferred. From her self-imposed house arrest, Dhada says she'll venture back onto Facebook, but her experience is certain to color her musings. "I don't want this to happen again," she says, laughing, "but I'll be careful next time."